Two potent myths have traditionally defined our understanding of the artist Edvard Munch (1862-1944): he was mentally unstable, as his iconic work The Scream (1893) suggests, and he was radically independent, following his own singular vision. 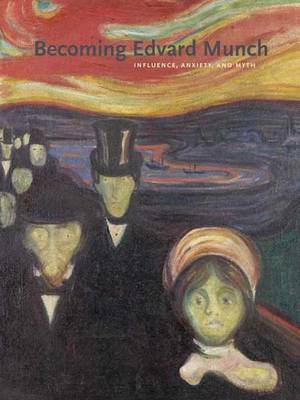 Becoming Edvard Munch: Influence, Anxiety, and Myth persuasively challenges these entrenched perceptions. In this book, Jay A. Clarke demonstrates that Munch was thoroughly in control of his artistic identity, a savvy businessman skilled in responding to the market and shaping popular opinion. Moreover, the author shows that Munch was keenly aware of the art world of his day, adopting motifs, styles, and techniques from a wide variety of sources, including many Scandinavian artists. By presenting Munch's paintings, prints, and drawings in relation to those of European contemporaries, including Harriet Backer, James Ensor, Vincent van Gogh, Max Klinger, Christian Krohg, and Claude Monet, Clarke reveals often surprising connections and influences. This interpretive approach, grounded in Munch's diaries and letters, period criticism, and the artworks themselves, reintroduces Munch as an artist who cultivated myths both visual and personal. Becoming Edvard Munch features beautiful color reproductions of approximately 150 works, including 75 paintings and 75 works on paper by Munch and his peers.